This is the archive area for the PC-Card Reader/Writer (MCDISK) and shows products that are not manufactured anymore. For current products, please check out the PC-Card Readers/Writers area. 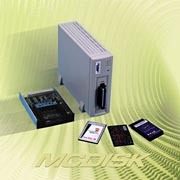 The MCDISK (Memory Card DISK) is a card reader/writer device for PCMCIA/JEIDA compatible memory cards. These cards are widely used in mobile computers and are available from many manufacturers in various types and sizes. The MCDISK can handle a wide variety of cards of any size: SRAM, ROM, OTP, FLASH, EEPROM, PC-ATA disks (mechanical/silicon miniature disk drives) as well as I/O cards for special applications. All mechanical card types (I, II, III and IV/oversized) are supported.